Home » Blog » Budtender Job Description: What is a Budtender? Budtender Job Description: What is a Budtender? With so much discussion over legalization efforts for medical and recreational marijuana, in conjunction with the renewal and strengthening of cannabis culture–individuals across the country are swarming toward the hottest marijuana jobs in the industry. Odds are if you’re reading this, you’re familiar with the term budtender, yet still unsure about the role this key employee plays in the consumer-driven marijuana biz. By offering a general budtender job description, I hope to provide some guidance in facilitating further research on this popularly sought after career. 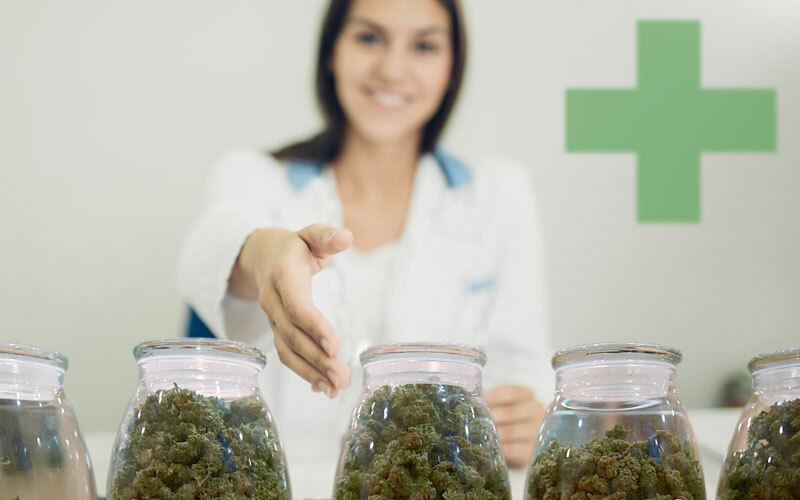 Before getting into the budtender job description nitty gritty, it helps to gain a bit of insight into the current marijuana dispensary job market. Frankly, it can be hard to find budtender jobs. Especially with the advent of adult-use recreational cannabis legalization, employers are receiving unbelievably high volumes of applications correlative with the novel demand of cannabis products and legalization. The industry attracts both seasoned stoners who have been waiting for the legal industry to break, as well as individuals who feel that the marijuana industry would offer a fun change of pace from their existing customer service position. When it comes to the latter group, it’s important to get something straight: dispensary owners and hiring managers only want budtenders who are truly passionate about cannabis. Though it may be considered an entry-level pursuit, not just anyone can be budtender. A budtender is the friendly canna-whiz behind the marijuana dispensary counter who guides medical patients and adult customers through the process of understanding, selecting and purchasing cannabis products, such as flower, concentrates, edibles and topicals. Budtenders specialize in customer service and so are not only extremely knowledgeable in the area of medical marijuana, but friendly and compassionate individuals first and foremost. Often times, budtender jobs double as marijuana dispensary receptionist jobs, and vice versa. Before establishing yourself as your neighborhood’s legal weed wizard, you must first gain, then maintain a hefty knowledge of strains, products, consumption methods and cannabis culture. This includes being current on state and municipal regulations for medical and recreational marijuana. It will take more than a couple days of hurried Google searching to determine the medical implications and effects of individual strains: budtenders are serious about cannabis and want to help drive the industry forward. Frequently, budtenders receive queries for customers surrounding the following three categories: medical implications and efficacy, effects/high and aroma/taste/aesthetic. While there surely are other factors that influence customer sales, the above reflect the current state of cannabis sales. For good reason, medical marijuana patients take their dispensary experiences seriously. It is important to highlight medical efficacy as a necessary element for a budtender job description. There is scientific and anecdotal evidence backing up how cannabis can treat a variety of illnesses from Anorexia Nervosa to chronic pain. Therefore, it is integral that budtenders can take stock of their products and accurately suggest solutions for patients. Given the amount of product options and accessibility for folks who live in “legal states” and cities, a growing culture of cannabis sticklers have cropped up, driving a trend for the greater appreciation and criticism of cannabis. Individuals visit dispensaries hoping to find the prettiest products with forward and complex aromas and flavor profiles. Aside from aesthetic and taste value, discussion of terpenes (the compounds that contain cannabis aromas) is an important development in further studies on the medical and cultural relevance of cannabis. This is not the last time I will highlight service as an integral part of a budtender job description. Budtenders act as the middleman between marijuana and the customer; therefore, it is essential that they represent the industry with a compassionate, yet professional demeanor. The demographic of marijuana dispensary visitors is likely more inclusive than you’d think. It’s not just stoners in hoodies with acoustic guitars–individuals of all ages, backgrounds, tolerances and experience levels make up the new legion of cannabis users, now that there is less need to be “in the closet” about consuming weed. Alas, a necessary addition to the budtender job description is operating with compliance to state and municipal regulations. Though dispensaries across the country may not morally agree or like the laws put in place by the government, they must adhere to them if they’d like to continue to legally operate. Budtenders must be extremely consistent in their work and follow the guidelines set in place by the business and legislation. This includes properly weighing, packaging and labeling marijuana products, as well as providing any and all necessary literature at the end of the sale. There are many different paths that contribute to the acquisition of budtender jobs. Having personal connections, marijuana experience and customer service expertise all serve you when determining what details to highlight on your application. Now that you have a general idea of a budtender job description, you can confidently structure your resume or application to reflect your knowledge of the position and the industry as a hole. Like it or not, nepotism is alive and well in the marijuana industry. Depending on who you know and how, you may be able to secure a position based on your credibility as a good friend, acquaintance, family member, etc. On the one hand, such nepotism can be viewed under a critical lense as an improper route for selecting qualified applicants; on the other hand, nepotism in the cannabusiness is in part due to its nature as a cash business that experiences a lot of internal theft. Knowing someone by association can sometimes be an employer’s best bet in preventing loss. The term “experience” in relation to the legal marijuana industry is up to interpretation, but often you will see that job listings require applicants to have marijuana industry experience. Using the budtender job description as a perfect example, it pays to have previous experience working directly with weed and other cannabis products. Sometimes employers only hire individuals who have previous experience working in other marijuana dispensaries, which makes it difficult for people to break into this part of the field. Other dispensaries value a wider variety of cannabis experience, including it in their job listing as an effort to weed out the most unqualified applicants. For this reason, be sure to pinpoint any and all marijuana experience you have, even if it means growing, trimming and curing your own plants at home. Of course, the more (proven) experience the better, but there are other factors that have equal stock to knowing about pot. The demand for experienced budtenders no doubt require that you stand out from other job seekers. If you have absolutely zero experience outside being a marijuana advocate and occasional smoker, I highly recommend you explore certification options and be sure to see if there are any training courses offered in your area. One of my favorite and probably best online training courses right now can be found at THC University. Check them out for an in-depth, interactive and engaging budtender course. Here it is again! In my experience applying for budtender jobs, the conversation I find myself running into the most is the topic of customer service experience. Having worked as a barista, I was able to secure some dispensary interviews for myself given my success preparing and selling a specialty product to customer. Ultimately, dispensary hiring managers look highly upon a solid salesperson. At the end of the day, dispensaries are trying to turn a profit, making it essential for a budtender job description to note the importance of customer service. Because marijuana industry salaries vary, it’s always vital to research the compensation and benefits offered by a dispensary. The going rate for entry level budtenders starts around ten dollars per hour plus tips and generally ranges between eleven and twelve dollars per hour plus tips. An obvious benefit of working as a budtender includes being surrounded with cannabis products and professional potheads on a daily basis. The staff of any given dispensary represent the informed, compassionate individuals helping to destroy the stigma attached to marijuana. Another upswing of selling legal bud is the significant employee discount on marijuana products many budtenders receive. For the most frequent and dedicated cannabis aficionados, this perk outweighs all the rest and provides reasoning for why so many people are trying to work as a budtender! The legal marijuana industry is experiencing an exciting and confusing time with recent developments in personal and even public marijuana use (in the case of Colorado’s Initiative 300). Right now, the budtender job description remains a distinct reminder of the primary goal of marijuana distribution: to facilitate the successful sale of products to customers and patients. As long as this position continues to act as a primary method for the distribution of legal cannabis products, the budtender will only grow to become an accepted contributor to the world of commerce. Ian Abernathy is a freelance cannabis writer based in Portland, Oregon. Abernathy is a longtime medical marijuana advocate who specializes in covering the legal marijuana job market.